I photographed the restored Ambler movie theatre while visiting Ambler last week.I used my nitecor flashlight to reveal the rich color and detail of the place.The Ambler Theater was opened by its owner Warner Bros. on December 31, 1928, with the movie “Our Dancing Daughters” starring Joan Crawford. An exuberant Spanish Colonial style architecture was employed to create a magical facade with Terra cotta, spacious lobbies (entry lobby, main lobby, vestibule lobby, then foyer), an ornate auditorium with 1,228 seats, and a Gottfried pipe organ (which is long gone). The builder, Phillip Harrison, previously built the Seville (now Bryn Mawr) and Lansdowne theatres, which may explain the Spanish Colonial similarities. Prior movies in Ambler had been shown in an opera house, a second story Civil War era theatre. 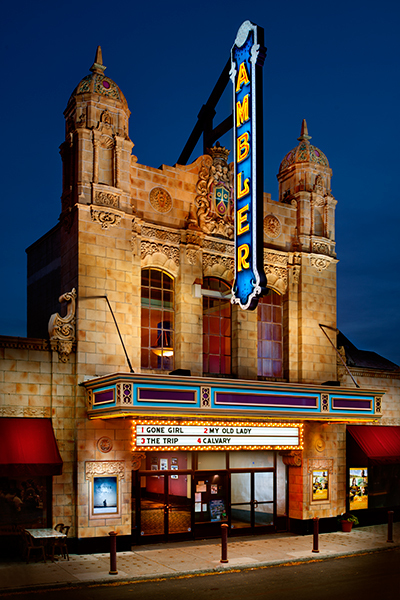 Due to the competition from TV and the multiplexes, the Ambler was no longer viable to continue as a for profit theatre with mainstream movies and ceased showing 35mm films about 1969 to 1970. By this time the auditorium’s side walls and front part of the ceiling were draped over. From the 1970’s until 1997 the Ambler was operated as a Christian cinema, showing films in 16mm including The Robe. The Ambler closed again, waiting re-use. The Christian group sold the theatre in 2001 to businessmen, who in turn sold the theatre to the nonprofit: Ambler Theater, Inc. The non-profit organization devoted two million dollars to renovations. Paint colors were chosen to match the original colors. No original carpet was found, so carpet was replicated from photographs with the appropriate colors selected. As the original ticket booth was long gone, a cheap modern ticket booth was removed and replaced with a retro style ticket booth. The ornate new ticket booth took its inspiration from the auditorium’s organ lofts. Built in the former rear of the orchestra seating area are two ‘black-box stadium seated auditoriums, equipped with digital surround sound. One auditorium has 150 seats, the other has 110 seats. The Ambler reopened February 28, 2003, with those two auditoriums showing the movies Nicholas Nickleby and Real Women Have Curves. As the original 30 foot towering vertical neon sign had been demolished in the late 1960’s, an exact replica was constructed by Bartush Signs and funded in part by a Keystone Grant from the Pennsylvania Historical and Museum Commission. The neon tower was installed in September, 2005 and officially lit on October 21, 2005. Renovation of the original front section of the auditorium began March, 2007. It reopened October 5, 2007 with the film Into the Wild. The original proscenium arch opening hosts the large movie screen (30 feet wide for ‘scope films), ornate decoration on the side walls, and organ lofts. This auditorium with stadium seating for 280 people has a ceiling with what looks like wood beams, but in reality they are made of plaster. Recent renovations have restored the marquee to its original 1928 majesty complete with neon trim and chaser lights. Additional fundraising is being undertaken for more renovations, including restoration of the facade. This entry was posted in Uncategorized and tagged Ambler, ambler theatre, Antique, architecture, Light Painting, Nostalgia, pa, Photography. Bookmark the permalink. Really nice job on this one, Don. Beautiful building and you’ve done it justice. Thanks for the comment.it certainly wasn’t easy with traffic.good to hear from you.